Click here to learn about the logistics of staging the Children of Gyumri art show. Gyumri lies at the Western edge of present day Armenia, some 200 km from the capital of Yerevan. Long situated on the border between warring empires, the ancient Armenian city of Kumayri was known as the Russian imperial outpost of Alexandrapol following the tsarist incorporation of the southern Caucasus in 1804. Following WWI and Sovietization the city was renamed Leninikan. As Armenia’s second largest city Leninikan was the largest city in the 1988 Earthquke Zone, and suffered 10,000 casualties. Following independence in 1991, Armenians renamed the damaged city Gyumri, though many old timers still refer to it as Leninikan. Despite being the focus for international earthquake relief efforts, the population of Gyumri has fallen from 250,000 to an estimated 150,000 today. 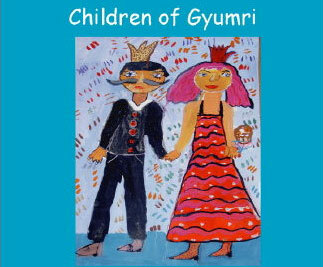 The idea of holding an art show to benefit the children of Gyumri was conceived on a visit to Armenia on June 11, 2005. 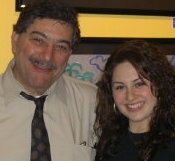 Coffee Works owner John Shahabian was visiting his daughter Tamara who was spending four months as a teacher with the Armenian Volunteer Corp (AVC). While there they traveled to the Western Armenian city of Gyumri, which was at the epicenter of the devastating earthquake of 1988, and visited an art school which had taken on the job of housing and nurturing many of the orphans left by the natural disaster. Seeing the delightful works of art created by these young students in such difficult circumstances, often with nothing more than powder paint with paper plates for canvases, gave them the idea to try to help raise funds for the school by hosting an art show back home in Sacramento, California. It was something the Coffee Works had been doing for many years for local public school art programs under the leadership of Coffee Works’ art curator Melinda Johnson. 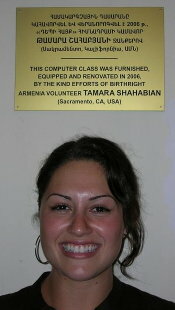 In the summer of 2006 Tamara returned to Armenia to oversee the distribution of the proceeds of the show. The school decided they wanted a computer facility to link their students to the outside world. Read more about Tamara’s Armenia Artworks Project by clicking here. Tamara decided to do another U.S. art show benefit for Armenian school kids and sponsored an exhibition in Yerevan to help select the art. What began as a regular weekend excursion with Birthright Armenia turned into one of the defining moments of my four-month stay as a volunteer in Armenia in 2005. The destination was Gyumri, Armenia’s second largest city, which was once known for its business-minded and artistically talented populace. However, my first glimpse of Gyumri was disheartening as I walked carefully past the crumbled building ruins and other reminders of the devastating 1988 earthquake. In the midst of these feelings of despair, our volunteer group visited a local school that serves as both an aesthetic center and orphanage that promotes artistic development among the city’s youth. At the Gyumri Aesthetic Center, children develop their creative talents such as painting, carpet weaving, dancing and singing. It was at this school that I was able to glimpse the true spirit of what Gyumri had once been. Among the children’s artwork, a feeling of optimism resounded despite the city’s struggles. By chance, my father was visiting me in Armenia at the time of our group’s excursion to Gyumri so he accompanied us to the Aesthetic Center. We were both astounded by the level of talent exhibited by the school’s young artists and by the way that the artwork so drastically contrasted Gyumri’s dismal appearance. The art center was filled with hope and inspiration, and thus in us an idea was born. With the help of the Birthright Armenia staff in both Yerevan and the US, I was able to gather nearly 50 pieces of artwork from the school in Gyumri and transport them to my home in California. Each piece was prepared and framed for an exhibition that would be held at the Coffee Works in Sacramento. 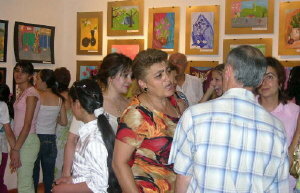 The exhibition opened in March of 2006, and the community’s response to the art from Gyumri was overwhelming. 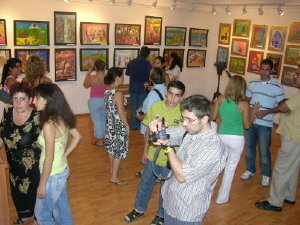 More than half of the artworks sold on the opening day of the show. The outcome of the show far exceeded my expectations, as nearly all of the artwork eventually sold (including large paintings, paper plate drawings, and small and medium-sized carpet weavings) and some also made pure donations to the cause. 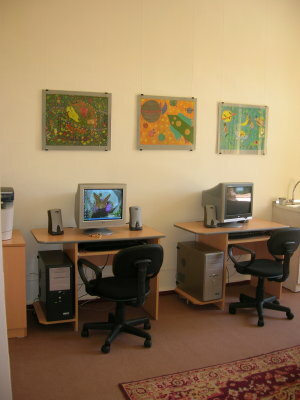 We raised slightly over $6,000 and it was mutually decided to use the money to create the first computer and internet room in the Gyumri Aesthetic Center. The funds raised by the art show provided the school with four brand new computers, along with a printer/copier/scanner machine and furnishings for the room including a new roof, paint job, carpet, desks, and chairs and of course, frames for the children’s art to be displayed on the walls. The newly opened computer room is a resource for the students; it can be used to develop graphic design and other artistic technical skills. Also, the internet has endless potential as a learning tool for children. My aspiration for the show and the resulting computer center is to help cultivate confidence and individual ambition in the students, which is necessary for the future well-being of Armenian youth. Due to the overwhelming response the show received, I realized it was important to continue and expand this bilateral exchange. To do so and to celebrate the talents of children from other parts of Armenia, I turned to support from Birthright Armenia’s Next Step Grant Fund. Their financial support enabled me to visit various schools around the country and to encourage young students to utilize their art potential. During these two additional months in Armenia I collected enough material for a second art show, this one to be held in New York City. (Although I am originally from Sacramento, California, I am pursuing graduate studies in International Affairs in New York and working with AGBU). 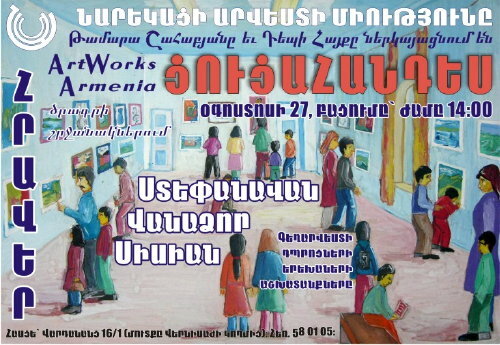 This show will feature art chosen from three schools located in the cities of Vanadzor, Stepanvan, and Sissian. Each school has provided approximately 20 pieces for the exhibition. The Naregatsi Art Institute in Yerevan proved invaluable in helping to gather the artworks and stay connected to the three schools. Naregatsi has a beautiful facility in the center of Yerevan where they hosted a first-round exhibition of this new show for the local community on 27 August 2006. The artwork was not for sale at the show in Yerevan; but instead served as a kind of local celebration of the children’s work before its journey to America. There are of course no guarantees of success when organizing an art show fundraising project. The success of the first show was beyond our expectations. But I am very hopeful and confident that the artwork and the cause will be similarly well-received in New York, and that those who attend the show will be able to connect with the art and feel certain that their contributions will make a real difference to kids growing up in Armenia. My hope is to raise enough funds from the show that, each of the three schools can implement some small new program that may demonstrate to their students the empowerment of knowledge and individual effort. But the success of this project will not be measured solely by providing a few schools in Armenia with a modest sum of money, but also by the effect it has on the relationship between members of the Diaspora and their ethnic homeland. Philanthropic efforts are of course a mutually beneficial way to foster a reconnection between the newly-free Armenians and highly-assimilated Armenian-Americans, like my generation. When I first visited Armenia in 2001, I observed the country through a relatively remote tourist lens. It was not until I decided to return after college in 2005 as a volunteer for Birthright Armenia and the Armenian Volunteer Corps (AVC) that I discovered my own ability and desire to contribute actively to Armenia’s future. Although I have no formal artistic training, I found something in the children’s artwork that was universally inspirational.Children are wonderfully expressive and uninhibited in their art and through it are able to convey their pure hopes, experiences, fears and dreams, without barriers of language or geography. By encouraging these expressions we can demonstrate our own faith in the strong, talented and intelligent youth who are the future of Armenia. It is my belief that by touching souls across the distant divide, children’s art is a small but powerful way to foster change, development, and hope, and that is the ultimate goal of the Artworks Armenia project.